This text traces the evolution of sports development in the UK in the context of broader shifts in sport and social policy. It explores the emergence of sports development from the early years of public policy for sport in the 1960s to the contemporary era. This analysis is set against a background of policy initiatives, from 'Sport For All', 'Action Sport' and CCT, to the National Lottery and the contemporary emphasis on sport as a factor in the social and cultural well-being of the nation. 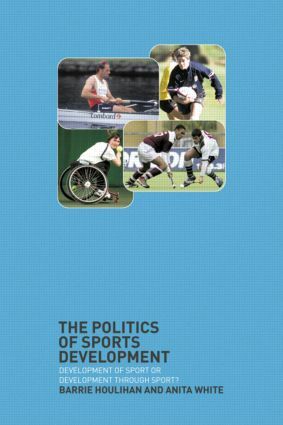 Incorporating original material from major case studies and the national governing bodies of hockey, rowing, rugby union and tennis, the book examines the reality of "doing sports development" within this changing social and political policy climate. 1. The origins of sports development: the 1960s to the mid 1970s 2. The mid 1970s to the early 1990s: sports development comes of age 3. The early 1990s to 1997: welfare restructuring and Major's sporting glory 4. New Labour: the reinvigoration of sport development 5. Sports development in four local authorities 6. Sports development in four national governing bodies of sport 7. Development of sport and / or development through sport?